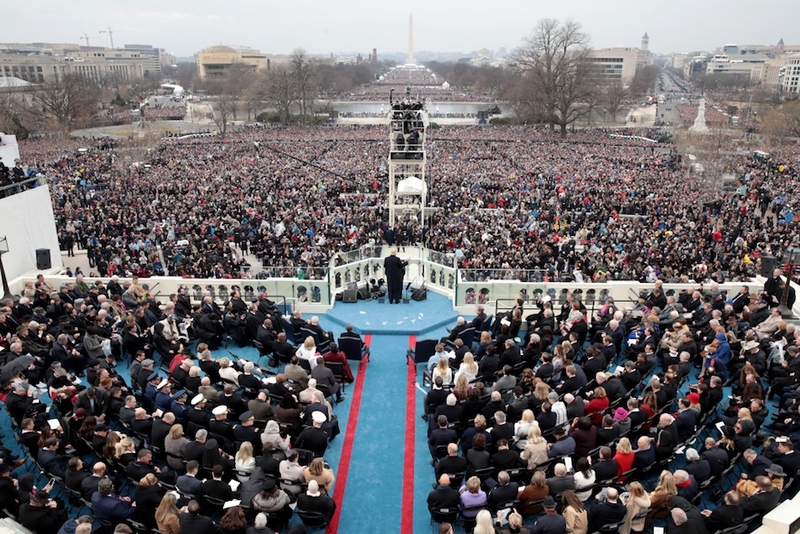 Given such a cosmic context it’s no surprise the “birth” of this radical president on Inauguration Day January 20, 2017 was a carefully choreographed “super ritual” complete with a perfectly executed series of “as above, so below” syncs designed to enthroned Trump as Osiris the ancient Egyptian god of the underworld who was sometimes referred to as the “Foremost of the West” (Khenti-Amentiu). Very few, quite possibly only the hidden designers of the whole ritual, have known about this king-making ritual… until now. 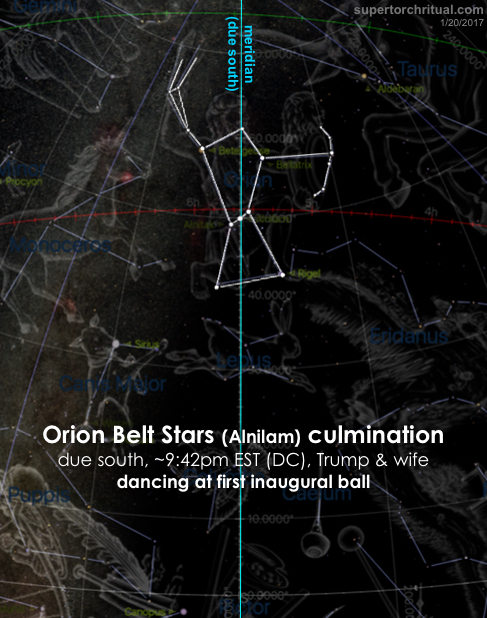 The central cosmic figure on Inauguration Day was Osiris in the form of Orion, and his Belt Stars. 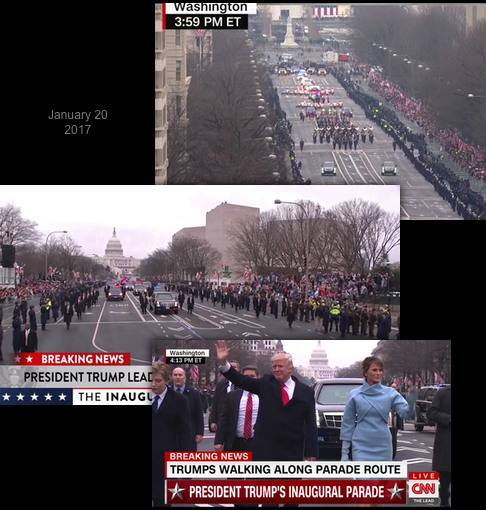 …which began a bit after 3:30 pm local time (EST) at the US Capitol following Trump’s swearing in ceremony and inaugural speech at noon where he officially – but not yet cosmically – became president. 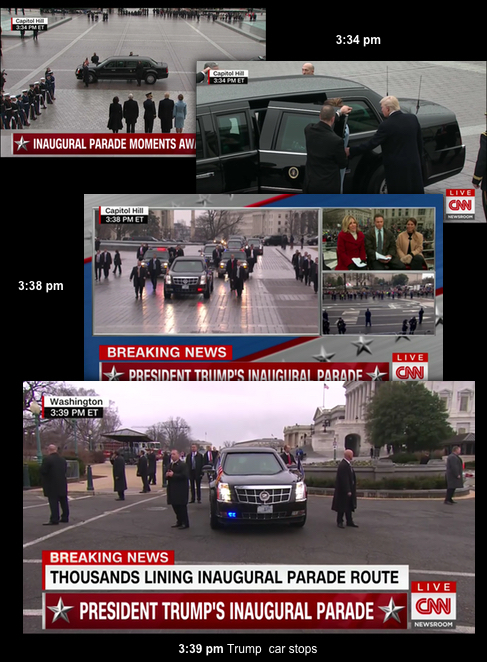 Trump’s car dubbed “the Beast” began slowly moving toward Constitution Avenue on the north side of the Capitol at 3:34-38 pm EST. Upon reaching the gate the entourage paused for a few minutes as if waiting for something. The delay surely must have had some ostensible reason. But in the realm of multi-contextuality which gets more pronounced with significant world events, we always have the mundane explanations that satisfy the casual mind, and then we have the deeper cosmic designs that send the truth-seeking mind tumbling down the rabbit hole into a realm of truth not of this world. 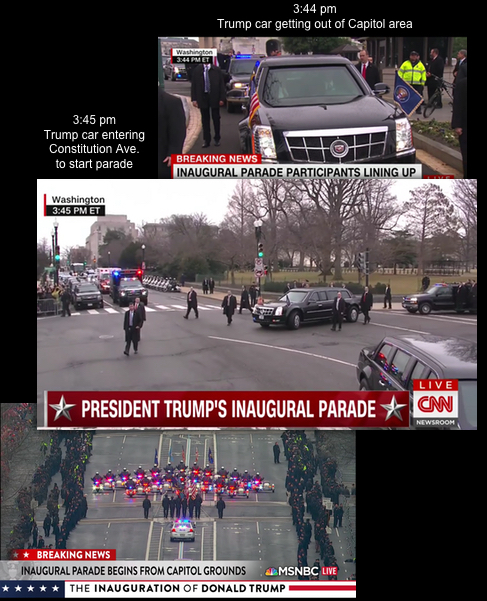 It was right at that moment (~3:45 pm) that the presidential procession resumed their march and exited the Capitol onto Constitution Avenue which leads to Pennsylvania Avenue where the parade would officially begin. 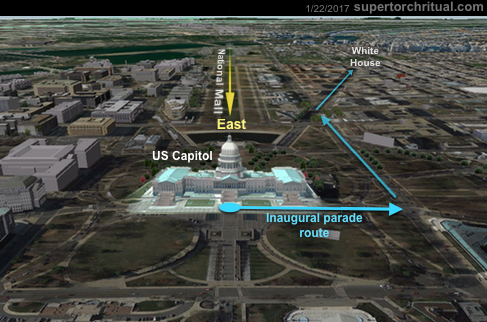 The inaugural parade in this way emerged directly from “behind” the Capitol on the east side (which is actually the front side of the Capitol) just as Orion was emerging due east directly behind the Capitol as seen from the National Mall which is a huge east-west axis. 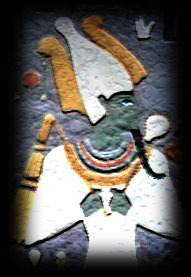 The implication was clear enough: Donald Trump – or the American presidency in general – is to be identified with Osiris, i.e. an “American pharaoh”. 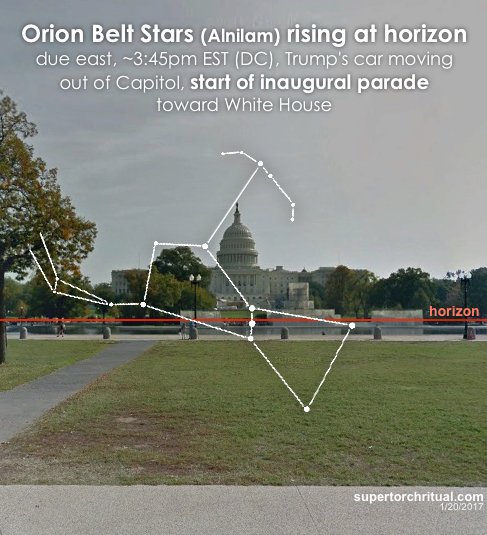 Orion, like Osiris in ancient Egyptian mythology, keeps dying and coming back to life everyday as the constellation sets and rises due west and due east in alignment with the National Mall. (This is a natural consequence of Orion semi-permanently straddling the celestial equator.) In the middle of the National Mall stands the Washington Monument which is an ancient Egyptian-style obelisk the traditional symbolism of which (obelisks & pyramids) has to do with Osiris, the phoenix(bennu), and such. 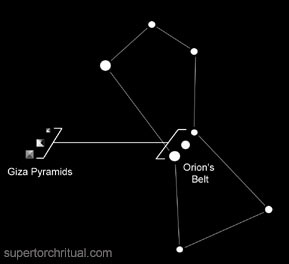 The “Orion = Osiris = pyramid” equation is also evident in the greatest pyramids on Earth at Giza which are arranged to mimic the shape of the Orion Belt Stars per Robert Bauval’s Orion Correlation Theory. 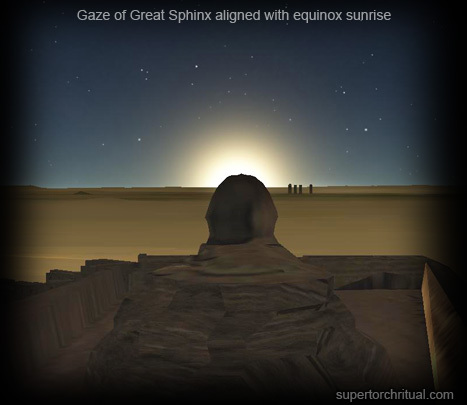 Giza in this way is a form of the Egyptian underworld Duat guarded by the Great Sphinx which is connected via a causeway to the middle pyramid, corresponding to the middle star of Orion’s Belt Alnilam, i.e. the star that triggered the Trump’s inaugural procession. 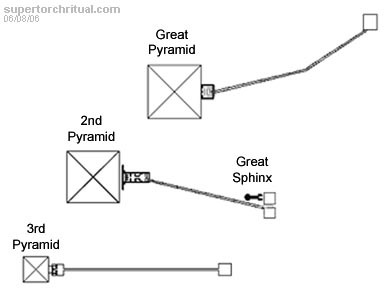 Like the National Mall, the Great Sphinx (gaze) is oriented precisely along the east-west axis. 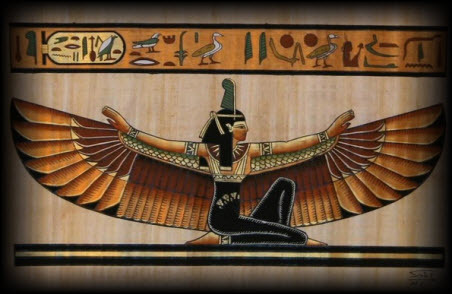 Celestially Isis-Sirius has attracted most attention during her “rebirth” in the form the star’s “heliacal rising” when it reappears just before sunrise after spending months hidden in the glare of the Sun. 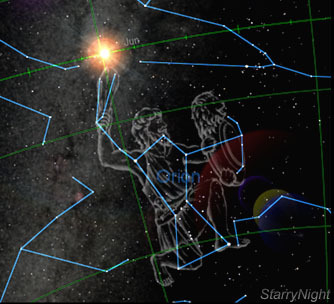 The star’s rising was of enormous importance to the Egyptian calendar and astronomical development. In the early dynastic period of Egypt the annual inundation of the Nile coincided with the heliacal rising of Sirius and marked the summer solstice. 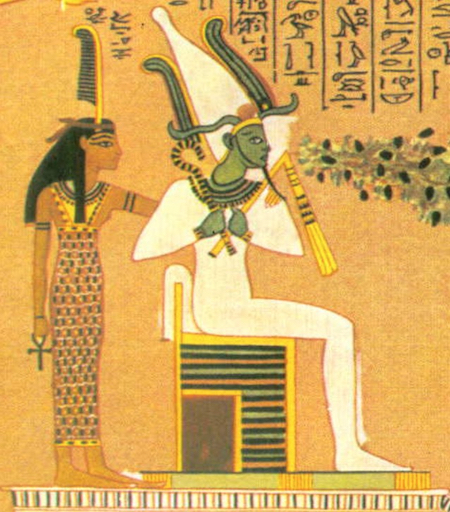 The flood brought fertile sediment to the land of Egypt, echoing the magical impregnation of Isis by resurrected Osiris. 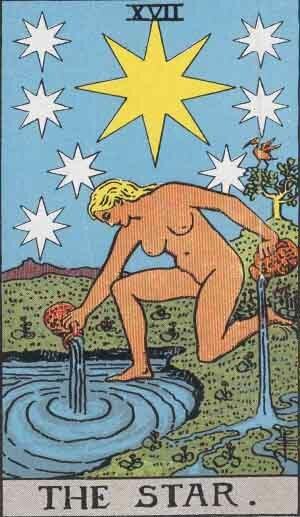 The whole sequence was a celestially triggered expression of that drama. 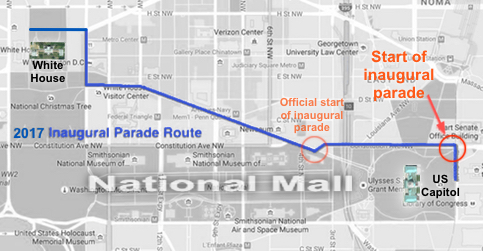 In Washington DC, the heliacal rising of Sirius is unmistakably but very quietly acknowledged by Pennsylvania Avenue (aka “America’s main street”) which is where the presidential inauguration parade took place as the new president marched from the Capitol to the White House. The avenue is angled just right so that it aligns with the sunset on ~August 12-13 every year. 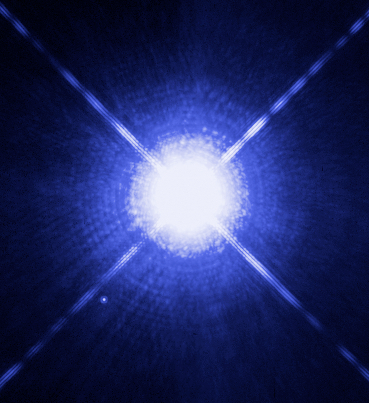 This precisely coincides with the day of Sirius’ “rebirth” at the latitude of Washington DC! Sirius rises 21.2 degrees south of east in DC with atmospheric refraction taken into account (which makes stars visible when slightly below the horizon). 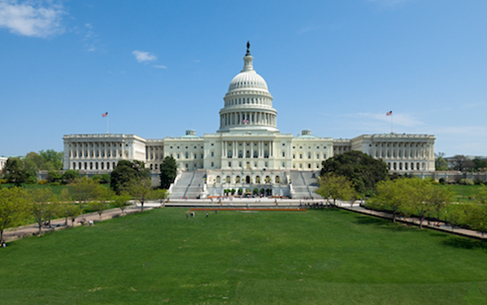 This preciselymatches the angle of the line going from the “front porch” of the White House (which is the north side facing away from the National Mall) to the center of the “front porch” of the Capitol on the west side (which is actually the back side). A remarkable alignment and one that I don’t think anyone in the general public has noticed before. Without atmospheric refraction, the rising angle of Sirius in DC would be 21.7 degrees south of east. 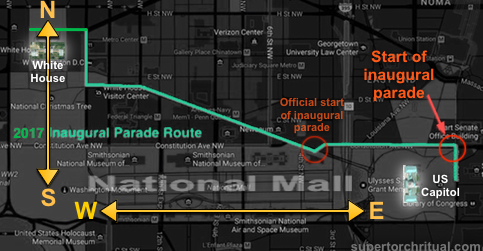 This one precisely matches the angle of the line connecting the starting point and the destination of the inaugural parade! 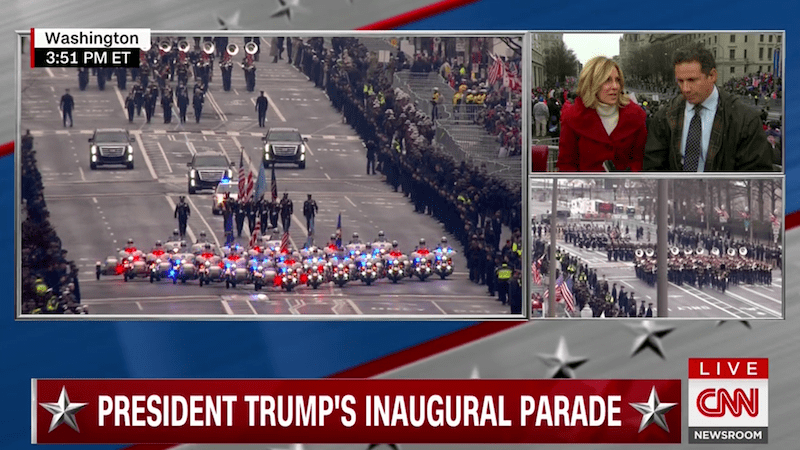 Trump and his family “reviewed” the parade for more than an hour in the stand from ~5:22 pm to roughly 6:50 pm. It was right during this period that Sirius actually rose directly behind the Capitol, at 5:45 pm. The First Couple had been inside the White House and had not been seen in public since they left the inauguration parade before 7 pm. 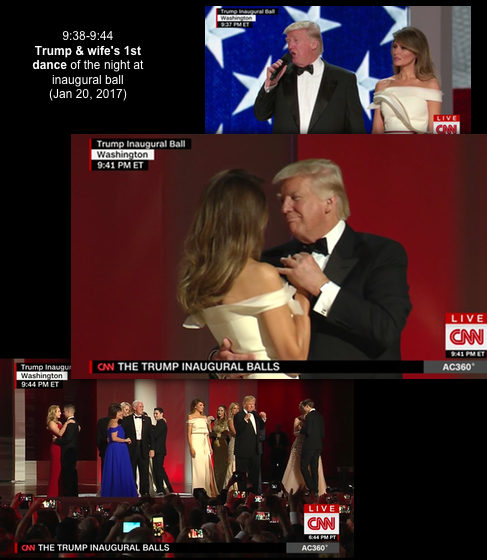 They reappeared at their first inaugural ball a little after 9:30 pm and had their first dance to the music of Sinatra’s “My Way” at 9:38-44 pm. This was precisely when Orion’s Belt – and more specifically the middle star Alnilam – was culminating due south reaching its highest point in the local sky. It was right at this moment around 9:42 pm EST that Donald Trump was being enthroned as an American pharaoh. This was a very powerful, very magical ancient Egyptian ritual taking place in plain sight. For better or for worse, Donald Trump was accorded this honor and heavenly force after being elected as the leader of the most powerful nation on the planet. The “magic” thus bestowed upon him is of the highest quality. And it is now up to him to use this cosmic influence to reshape the world as he sees fit. He can make the world “great” or he can destroy it. The people chose him. The stars complied and blessed him. Now he has the fate of the world in his hands. Scary? Yes, but here we are. Humanity has reached the biggest crossroads in history in the 21st century with the next New World rising on the horizon. Ready or not, this baby will soon be born. Will Trump rise to the occasion or will he go down in flames and the world with him? THE MEANINGS OF THE REVELATION 12 SIGN! * What will happen Sept, 23,2017?